Lucy joins me for What I Wore Wednesday, even though she's not wearing anything. I wore this outfit today. The first time I wore it was the day Obama won the 2008 Presidential election. That makes it my lucky outfit, right? I need your help! I'm finding it hard to get people to photograph me on Wednesdays. Do you WIWW ladies have any tips for taking good selfies? I'm tired of shooting myself in the bathroom. I took a few photos in the attic, but I don't think that's a good environment either. I'd like to maybe take some outside. Is that possible? Help! Thanks so much for reading this blog entry! I hope it was fun. Please like Olivia Cleans Green on Facebook, join my email list, follow me on Twitter, and subscribe to my blog posts (by RSS or email) to keep in touch and discover more creative green homemaking tips. 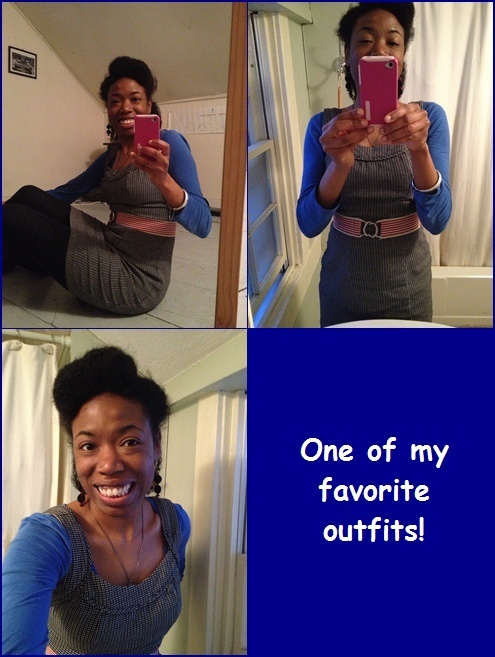 Love the idea of a lucky outfit, I use to have one and now I need another! Visiting from WIWW!